In the early years of the twentieth century the cable tram network of inner Melbourne, which had been built in the 1880s, was augmented by an electric tram network built and operated by municipal tramways trusts in the various expanding suburbs. 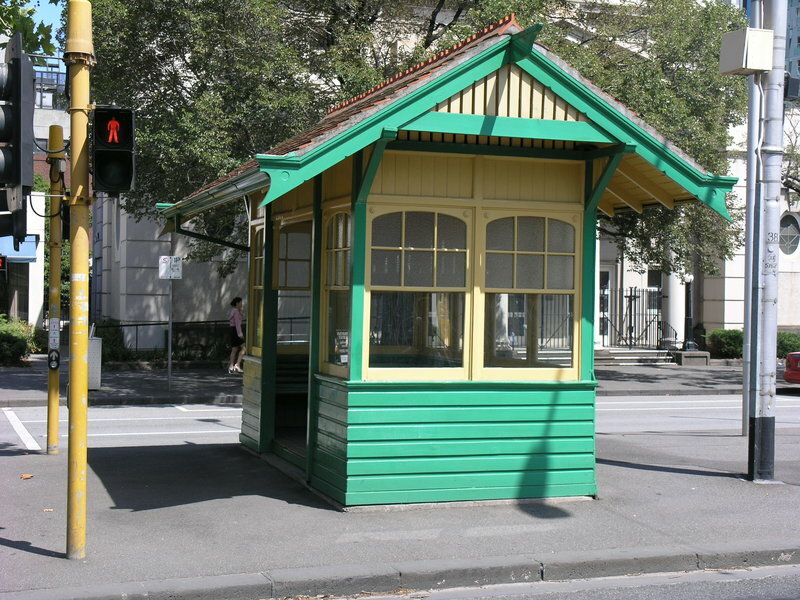 The tram shelter at the corner of St Kilda Road and Dorcas Street South Melbourne is one of five remaining from from of a distinct group of nine picturesque closed timber shelters built between 1912 and 1927 in a style based on Edwardian domestic fashion. The St Kilda Road/Dorcas Street South Melbourne tram shelter, like the Macarthur Street East Melbourne shelter, was built by the Tramways Board (1916-19) who operated the cable trams. It was designed in 1916 by Frank Stapley, an architect who was also a Melbourne City Mayor and Councillor and an influential advocate for the town planning movement in Victoria. Both shelters were built in 1917. Both were related in basic form to the earlier closed shelter of 1915 at St Kilda Road/Commercial Road. 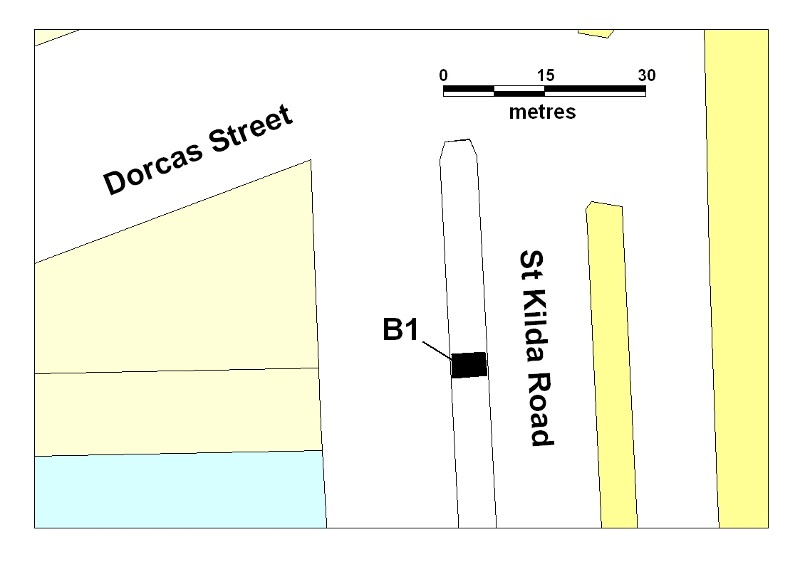 The Macarthur and Dorcas Street shelters were also precedents for the St Kilda Road/High Street and Lorne Street shelters of 1927. The timber-framed shelter with raised timber floor is clad to sill height externally in horizontal ship-lap boards and internally in vertical v jointed lining boards. Similar boards cover the ceiling. The floor is the concrete slab upon which the shelter stands. The benches are of timber frames and slats. The upper halves of timber framed windows are in multi paned patterned translucent glass with a segmental arch head. The framing continues above with internal and external vertical boarding set in to the same depth as the window. The gable section of wall is clad in vertical slats spaced to give ventilation. The gable roof is clad in terracotta shingles with a crested terracotta ridge. The rafters are exposed under the projecting eaves with a spaced board lining above. The gables project a similar distance to the eaves and are supported on timber brackets with vertical infill. The upper section is filled with a horizontal board at ceiling height to match the barges and an infill of vertical spaced boards. This shelter shows typical scrolled carving of the projecting ridge-beam and barge end upturns which hides the end of the gutter. The Dorcas Street shelter has, in addition, small timber bosses in the spandrels of the window head arches. The shelter has lost its original Tramways Board monograms from the projecting gable ends. The shelter has been moved a distance from its original location on the median at the junction with Dorcas Street, and the opening which originally faced the centre of the street, has been reoriented. The shelter sustained considerable damage in the 1990s but has since been repaired. The tram shelter at the corner of St Kilda Rd and Dorcas St South Melbourne is of historical and architectural significance to the State of Victoria. The tram shelter at the corner of St Kilda Rd and Dorcas St South Melbourne is of historical significance for its association with the cable tramway network, which played an important part in the history of transport in Melbourne. It is also associated with the short period in which the Tramways Board administered the cable tram network. 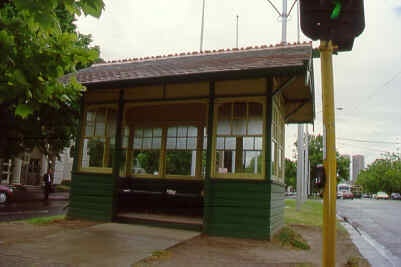 The tram shelter at the corner of St Kilda Rd and Dorcas Street South Melbourne is of architectural significance as one of only five remaining tram shelters from the city cable tram network which were designed as picturesque pavilions in the domestic Edwardian style of the period. The tram shelter is also of architectural significance as an important example of early twentieth century street architecture. Tram Shelter, Corner St Kilda Road and Dorcas Street, Melbourne, Port Phillip City Council. 1. All the building being the tram shelter marked B1 on plan 1869 held by the Executive Director. 2. All the land to the extent of the eaves overhang marked L1 on Plan 1869 held by the Executive Director.